Today Columbus’ own Jack Nicklaus — who is 75 years old — made a hole-in-one in the Masters par three tournament. You can check it out above. I’ve been playing golf since I was a kid, and I’ve never come even moderately close to a hole in one, even on flukey, ricochet off the golf cart grounds, much less hitting it ten feet past the hole then drawing the ball back into the cup. I guess that’s why Nicklaus — the greatest golfer of all time — is called the Golden Bear, but maybe he should be called the Ageless Bear. I’d take his swing right now, no questions asked. I don’t watch much golf on TV. I like to play the game — at least, usually I do — but watching it typically doesn’t have much appeal. The Masters is an exception, however. Every spring I tune in to watch CBS report, in whispered, measured tones, on the unfolding drama at Augusta National Golf Club. Everything about the tournament reeks of tradition. Every hole has a special name, like “Golden Bell” (number 12, for those who don’t have the names memorized). The broadcast features lots of old black and white photographs. The winner doesn’t just get a trophy, he gets a green jacket that means he will forever be invited back every spring to wear his coat and eat with his fellow champions. And the Masters is one of those signs of the season — when the best golfers in the world are gagging in the vicinity of Raes Creek, you know spring is here. 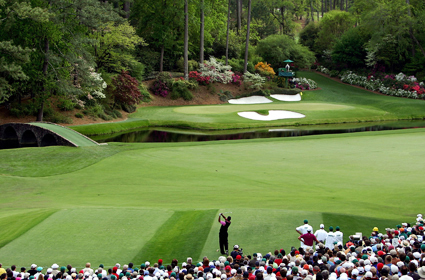 Of course, the best thing about the Masters is that the golf usually is spectacular, because Augusta National is perfectly set up for a major championship. It doesn’t attempt to overwhelm the golfers, as the U.S. Open courses often do. Instead, it offers opportunities for birdies and eagles — but always with an accompanying risk that a bad shot will produce bogeys, double bogeys, and other scores that can knock you out of contention. The course lets the pressure have its effect on the golfers and invites viewers to watch who can best control his nerves. Yesterday’s round was no exception. Some golfers hit tremendous shots and posted great rounds that have put them high up on the leaderboard; others faltered and dropped out of contention. It’s just wonderful TV, whether you like golf or not. When today’s round starts, and the leaders start sweating over those tricky six-foot putts on Augusta National’s lightning-fast greens, I’ll be watching.